Thanks to scientists, whale-watch organisations and the whale watching public, P118 was located. P118, a male who was seen with group P in 2005 in Tysfjord, Norway. P118 was seen on June 26th, 2012 and also June 22nd, 2012 outside Sto, Norway. At the moment scientists are comparing the photos of both encounters to look for more members of group P.
Read more information on the recent sighting of P118. These are the ID photos of Group P, Morgan’s extended or closely related family. Heike Vester and Filipa Samarra identified Group P by comparing Morgan’s distinctive calls with the recent call type catalogue of wild Norwegian killer whales developed by Heike Vester, and came to the conclusion that Morgan is likely to have originated from either from group P or a group closely related to group P. You can download the full report. 92% of the calls made by Morgan were matched to a Norwegian orca group. Only 0.3% of call-types were not matched to either NP or P pod. At least seven additional groups were matched to at least five call types. Morgan’s acoustic repertoire may be limited because of her confinement in a concrete barren tank and due to her young age. There are only extremely limited field research projects being currently conducted on Norwegian orca and further research is clearly needed. It is possible that the two ‘non-matched’ calls are ‘contact’ or ‘distress’ calls. Such calls would not necessarily be recorded from orca which are safely in the context of their social groups. 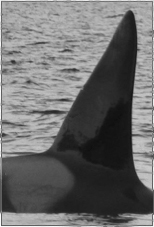 Play-back of Morgan’s calls to wild orca, or wild orca calls to Morgan, has not been conducted and may provide additional information and call-types. 77.7% of Morgan’s call types (seven of nine) were matched to P pod. Only one hour of recordings of P pod were used to match these 77.7% call types. Not all members of P pod have been photographically identified, therefore it is not possible to ascertain if they have been present or not in Norwegian waters. 57% of Morgan’s call types (four of nine) were matched to NP pod (with AA+BI).